To anyone remotely into Punk Rock music, today was a sad day seven years ago. 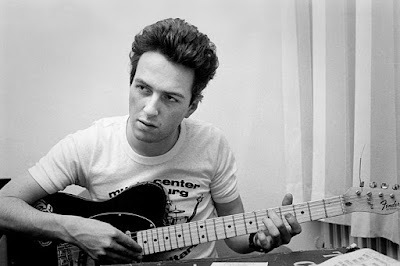 On December 22nd 2002 Joe Strummer died and, according to many, music died with him. Personally I don’t think music will die as long as I got functioning eardrums, and even then Strummer’s musical legacy is left behind for me to enjoy. And for every person with good taste in music to enjoy it with me. I think Joe Strummer was one of many great musicians and definitely a charismatic frontman, even though I’m not all too familiar with his solo work or the other bands he did after The Clash, but it’s safe to say that many of my days have been brightened by the first four albums by The Clash. I know a lot of people won’t agree with me and it gets you more street cred to like their first two records, but my favorite The Clash album will always be London Calling. Thirty years after its release, this album still sounds catchy and fresh to me. I know it gets talked down on because it supposedly is “too mainstream” and “cheesy”, but to me this album is just flawless. Yes ofcourse the self-titled album has a grittier and more Punk Rock sound, and Give ‘Em Enough Rope has less Reggea and Ska influences, but I’m not saying it’s their best album, I’m just saying it’s my favorite and the one I listen to the most. In my eyes Punk by no means needs to be associated with Pop Culture, but this is 2009 so get over it and just agree with me that London Calling is the perfect transition from Punk to Rock music. Show me a man that tells me ‘spanish bombs’ isn’t as perfect as a rock song will ever be, and I’ll show you a man that doesn’t know a thing about music. Show me a woman that doesn’t get fired up hearing ‘brand new Cadillac’ and I’ll show you a woman that has no heart and soul. Thank you Joe Strummer, for the many fine moments I’ve experienced listening to The Clash. Rest In Peace.